When it comes to running a business, marketing is a more than essential component of what you do. The old adage “if you build it, they will come” is rarely true these days—if you build it, no one will come unless you market it well. There are about 28 million small businesses in America today, and not all of them have big marketing budgets. Here are 5 creative ways to market and promote your business that won’t break the bank. Space is a commodity. 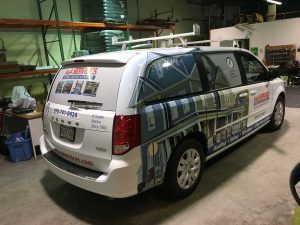 Custom wraps that can be printed and applied to most smooth surfaces can help draw eyes to your business and create a more polished look. Wrap stickers can also be applied to your car, ensuring that hundreds of people every day are exposed to your company’s advertisements. You might assume that Instagram, Facebook and Google ads are well out of reach. The advantage of these modern advertising platforms, however, is that they’re incredibly scalable. You can decide, often down to the dollar, exactly how much you want to spend. Today, most websites like this also offer tools for better refining your message and determining your ideal audience so that your ad money goes further. Promotions have long been a way to draw customers into businesses without spending too much money. This can be as simple as introducing a limited time coupon (make sure the savings really are good—you might lose a little money in the short term, but 100 new people will now know about your business). One way to really get your promotion going: run it on Instagram and require people to follow you and tag a friend. You might spend $50 total on the giveaway, meanwhile, you’ll gain 2,000 local, real followers. If you had to buy a sofa, would you trust the place with a big, fancy sign that says “Sofa Store,” or the guy selling them out of the back of a warehouse? The point here is that consumers trust these sort of signals indicating professionalism. Having professional decor, such as a branded wall mural or a printed floor mat, can help assure your customers that you’re investing in your company. If you need help getting your name out in the local community, why not team up with another small business to do it? An example: if you’re a sandwich stop, see if you can offer a catering discount for the Karate School’s next big event. Sports people and families are always looking for new on-the-go food options! To schedule your appointment with Dawn’s Sign Tech or to get your free quote, give us a call today at (978) 208-0012.